The aurora borealis lights up the Arctic night skies. Also called the Northern Lights, the phenomenon is the result of beams of charged particles tracing along the Earth’s magnetic field and entering the atmosphere. When they collide with oxygen and nitrogen in the atmosphere, the gases glow green, red and blue depending on the beam energy. While stunning for observers on the ground, aurora can cause problems for satellites as they orbit the Earth, along with all the technologies that rely on them. The aurora is accompanied by large electric currents that flow invisibly in the upper atmosphere, increasing the temperature around the aurora from about 260F (125C) to 980F (525C). This heating causes the thin upper atmosphere to expand, changing the slight drag on satellites and thereby shifting their orbital motion over time. This satellite drag is the limiting factor on how far into the future one can predict a satellite’s position. Satellite operators are continually looking for better models of satellite drag so they could plan further into the future and preserve the precious fuel necessary to correct satellite orbits. The key to prediction is an understanding of the energy input during an aurora display. 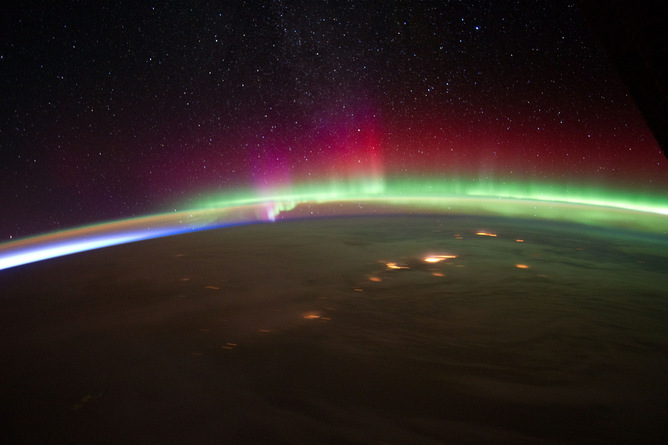 Aurora over Alaska as seen from the International Space Station. There have been maybe a hundred or so rockets launched into the aurora over the last 50 years to measure its energy flow. But those missions only took single measurements at the points where a rocket passed over the aurora. Our recent Auroral Spatial Structures Probe mission took a whole new approach to try to answer questions about the voltages and current surrounding the aurora and how they change over time. The rocket in its Styrofoam box that protects against extreme cold. The Sun never shines on the launch pads at the Poker Flat Research Range during the winter. Just outside of Fairbanks, Alaska, the range is nestled in a valley surrounded by rolling hills and shadows. It was -44F (-42C) outside and the NASA Auroral Spatial Structures Probe sat on a pad in a large Styrofoam box custom built to surround the 70-foot unmanned rocket. Warm air was blown into the box to keep the rocket – and all its scientific instruments – at room temperature. I sat in an equally warm science operations center at the top of the hill with my colleagues from the University of Alaska staring at computer screens that monitored the aurora borealis, the Earth’s magnetic field and the solar wind. I picked up the intercom to say “Operations Center, let’s pick up the count. 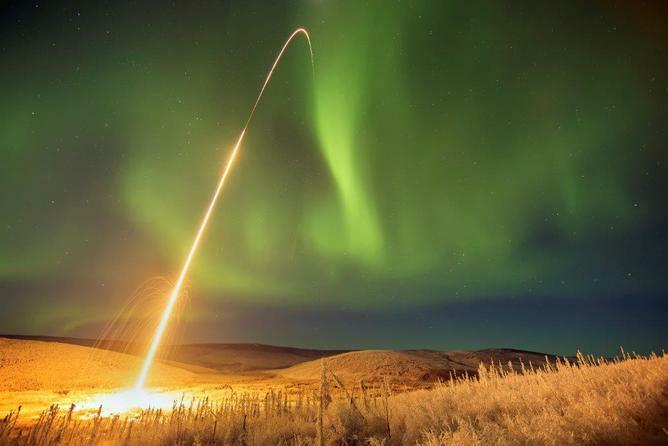 It is time to spend this rocket.” We had all been waiting for the aurora to appear brightly and be located in the right spot for the rocket flight. The countdown continued, ending in the traditional 10, 9, 8…. 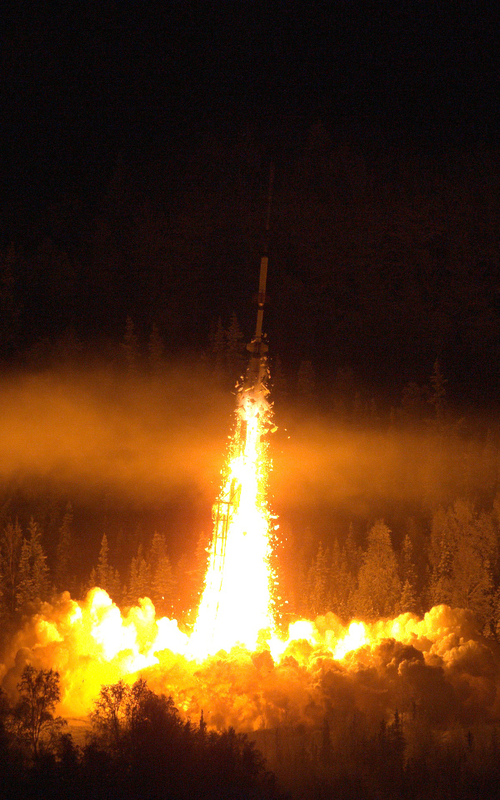 At zero, the 4-stage Oriole sounding rocket roared to life ripping right through the Styrofoam and up into the sky. There was a body-penetrating roar. Of course I had to run outside to watch as five years of planning and work was launched into the sky at exactly 1:41 a.m. Alaska Time on Wednesday, January 28. Who wouldn’t? The NASA Oriole 4 rocket carrying the Auroral Spatial Structures Probe breaking free from the Styrofoam thermal enclosure upon launch. So what was it probing? The “Visible Aurora” is very active, and beautiful. You can see changes that happen in fractions of seconds and within a few minutes, arcs can explode across the whole sky or simply disappear. We think the underling voltages and currents, the “Invisible Aurora,” are equally active but we don’t know. For example, features in the aurora that are 10 to 100 meters in size might last a few second while something that is 1 to 50 km in size might persist much longer, maybe seconds to minutes, but we just don’t know. If it were physically possible, I would have instruments remain stationary about 200 to 300 km above the Earth and within the aurora to make measurements over time of the currents and voltages driving them. Ideally, I’d like to have a whole bunch of them spread out, just sitting in place and not moving relative to the Earth while taking data, but that’s not possible. We don’t have an anti-gravity device to allow the payloads to hover at some spot over the Earth in space. The next best thing is to have multiple payloads follow the same path. Each payload then makes a measurement at some location in the aurora as it passes by. Making repairs just hours before launch when a a transmitter onboard one of the payloads failed. This is what we have done with the Auroral Spatial Structures Probe mission: we shot away multiple small payloads in precise directions so that we created a formation of sensors that pass through the same locations in space on a staggered time frame. NASA engineers at the Wallops Flight facility built an ejection system based on compressed air to shoot away small payloads at high speed. They get hit with 200 G of acceleration as they are kicked off and travel the length of a football field in two seconds. My group at the Utah State University Space Dynamics Lab built the small payload and science instruments to measure voltages and currents around the aurora and the density of the ionosphere. 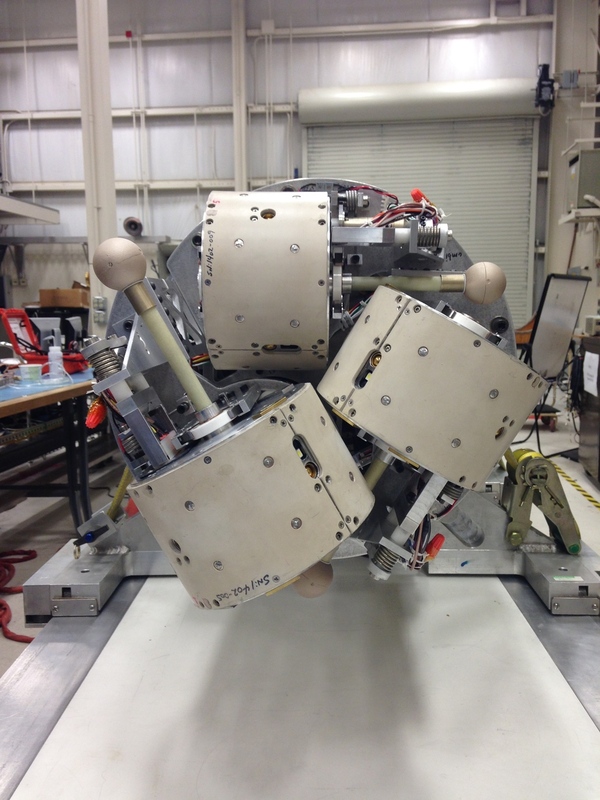 Three of the instrumented sub-payloads attached to the forward end of the payload. Six small payloads were ejected in pairs from each end of the rocket, three on each end. Four were placed in a line with the main payload, making the fifth in that string. The other two were sent out to the sides. It’s the most complex sounding rocket mission NASA has ever done. It was like flying seven sounding rockets at once over the aurora. The whole mission only lasted about 14 minutes with about eight of those minutes dedicated to science collection. We measured the magnetic fields using sensitive magnetometers from which auroral currents are computed. We also observed the electric fields and ionospheric density at each of the payloads. We had to predict where the aurora would be 10 to 20 minutes from the time we set the launch in motion – and we nailed it. After reaching an altitude of 521 km – about 120 km higher than the International Space Station – the sensors and spent rocket boosters splashed down in the Arctic Ocean north of Alaska. NASA engineers work inside the telemetry station where data from the rocket’s payloads are collected and analyzed. We have good data from all of the instruments and now we begin the detailed analysis. Understanding the size of the regions where the energy is input and how much the energy varies with time will calibrate satellite drag models. With luck what we learn from this mission will help satellite operators plan further into the future.